There is positive momentum and negative momentum. Are you moving toward what you want…or away from it? 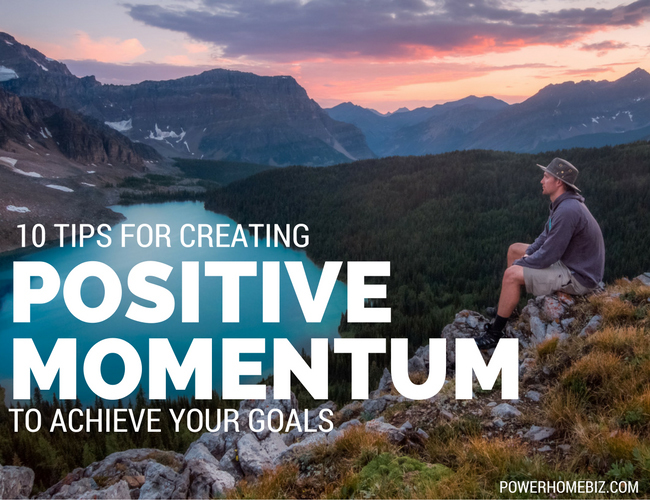 Here are ten ideas (or reminders) that can help you create and maintain momentum to achieve your goals. 1. Take some time to clarify your desired future outcome. Success is seeing what you want and moving toward what you see. What is important to you? Who are you becoming? How will your intention contribute to others? 2. Use visual reminders of your intention. Get some magazines and cut out pictures and words related to your goal. Put them where you’ll see them on a regular basis, like on your bathroom mirror, in your wallet, next to your computer screen, or on a poster board. 3. Set clear goals with clear timelines. Write down what the goal is, how you will know when you have achieved it, and a date when you will have achieved it. When an opportunity presents itself that fits with your vision, respond to it immediately. Ask yourself, “How much and what kind of fun will I have with this project?” This will help raise your energy. If you’re dreading the process there’s a good chance your momentum is going to get stifled. 6. Fill your mind with inspiration. Read books, listen to audio programs, and watch videos that educate, uplift and inspire you. Go to seminars and attend conventions related to your goal. Read about and learn about people who have done what you want to do. 7. Take a risk a day. So often to move towards what we really want requires us to get out of our comfort zone. By getting into the habit of taking a risk a day you will strengthen your courage as you take those important actions that can lead to your greatest opportunities. 8. Create a support team. Ask a few of your friends to form a group to support each other on your goals. Hire a personal coach or a business coach. Find a mentor. Hire a financial planner, an accountant, a fitness trainer, a counselor – whoever you think would add input, support, advice, feedback, and/or accountability to help you keep your attention on your intention. 9. Consistently review your top three intentions. Write down your top three intentions and read them every day so they’re fresh in your mind. This will add fuel to your fire and will help you focus your attention on what matters during your day. It will also help you recognize the opportunities that might help you move toward your desired future outcome. 10. Clarify how your intention also helps others. The fuel that can come from helping others can inspire you to take action and stay focused on your goals. When you see your intention as a cause and you find the passion and nobleness in your actions, you will likely have more energy to get the momentum going – and keep it going – as you move forward toward your intention. When you take action and stay focused on what really matters, you create momentum … and momentum creates the path to achieving your goals.